This is a certified organic estate . This is a family owned estate by Giovanni Zullo in the Gioia del Colle zone and has been theirs since the 19th century. Giovanni is the fourth generation owner. 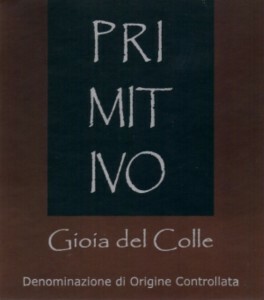 Gioia del Colle is the birthplace of Primitivo, but currently less famous than Puglia’s south western zone of Manduria. It typically produces Primitivo of a more masculine nature than Manduria. 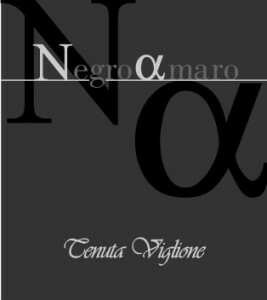 The Tenuta Viglione label for our 'Temprone' primitivo. 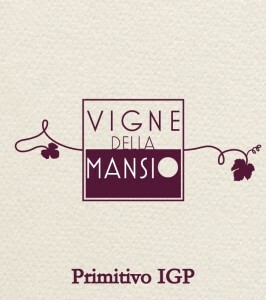 This certified organic estate is located in prime Primitivo growing area of Gioia Del Colle in the Murgia area of Puglia. This area has some of the highest altitudes vineyards up to 450m asl. Red soils of mostly clay, limestone and stone with a great deal of minerals. 15 year old vines Aged 24 months in stainless steel including 30% in both large and small barrels. Ruby red intense colour with violet glares. Scent and taste typically fruity of red berries and slightly of black sour cherry and plum with some spicy and balsamic notes. A perfect balance of smoothness, freshness and minerality. Aftertaste of toasted almond, typical of the Primitivo of Gioia del Colle. This fine wine comes from grapes of native Primitivo of Gioia del Colle in Apulia, rigorously harvested by hand. The vineyards are the oldest on the estate with up to 50 year old vines. 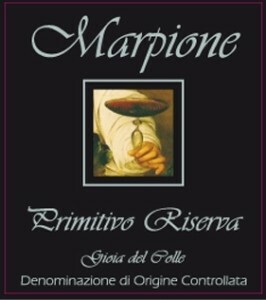 After the grape harvest, the “Marpione”, whose name means 'plunges its roots' in the local farmers traditions, is aged first in big barrels for 24 months and then 4 months in barriques. “Marpione” is characterized by its intense red color with purplish hues, and it features pleasing aromas of ripe fruits, in the mouth it’s well-rounded, soft, and lingering. It is great with roasted meat and aged cheese. This a 100% organic wine made from Primitivo grapes. The vineyards are on some of the highest altitudes in Puglia and sit at 480M asl. The soils are calcareous of dark brown color from marsh origins. Shell fossils can be found in the vineyard. Centuries ago, the ocean surrounded the hill where the vineyards are located. Age of vines: 13 years. The winery is brand new, and features a gravity fed system, with temperature controlled inox fermentation tanks and barrel aging rooms. Special care has been made to pick the grapes early in the morning at optimum maturity, avoiding over-ripeness. The grapes are carefully brought to the winery where they are de-stemmed, pressed and fermented in a gravity fed system, all with the goal of reducing oxidation and preserving the freshness of the fruit. The wine is stainless steel aged for 9 months. A deep purple color reveals a wine with a fresh, purple nose of dark black fruits. Lush in the mouth, the wine is fruit driven with very good acidity and light tannins.